Curtis Carl Merz was born April 17, 1938 in Newark and grew up in Springfield. Curt was a massive talent who earned all-state honors in football, basketball and track for Jonathan Dayton High School. He shared BMOC honors with Joe Schaffernoth, who went on to pitch in the majors for the Indians and Cubs. Curt was recruited by several colleges for his pass receiving skills and accepted a scholarship the University of Iowa. These were the beginning of the glory years for the Hawkeyes and coach Forest Evashevski. The year Curt played for the freshman team, the varsity won the Rose Bowl and achieved a #3 national ranking. At 6’4”and 220-plus pounds, Curt was a run-blocking end for the Hawkeyes as a sophomore in 1957. He caught a grand total of three passes for a 7–1–1 Iowa team that finished with a #6 ranking in the national polls. Quarterback Randy Duncan’s prime receiving target, Jim Gibbons, graduated after the season and Curt stepped in to take his place. 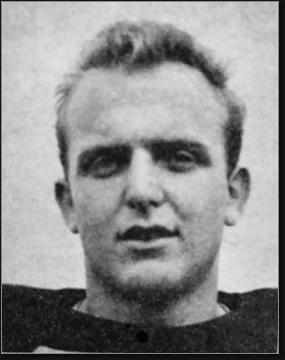 He led the Big Ten with 36 receptions in 1958 and did lots of road grading for Willie Fleming and Ray Jauch in the Hawkeyes’ run-oriented offense. In back-to-back games against Northwestern and Michigan, he caught key scoring passes. The victory over Michigan at Michigan was the Hawkeyes’ first win in Ann Arbor since the 1920s. Curt and end Don Norton (who would go on to star for the AFL Chargers) were known as the Gluefingers Gang. Iowa went 8–1–1 in 1958 and won the Big Ten. They wiped out Cal in the Rose Bowl and finished as the #2 ranked school in the nation. Curt was named a First-Team All-American. Norton did the bulk of the pass-catching in 1959, with Curt focused on run-blocking again, as well as seeing action on the defensive line. Iowa stumbled to 5–4 in his final collegiate season. After the season he was invited to play in the Blue-Gray Game and North-South Shrine Bowls, where he put his skills on display for pro scouts. The Philadelphia Eagles drafted Curt in the third round of the 1960 draft. He was too big and slow to play receiver in the NFL, and the tight end position had yet to truly develop. Rather than languishing on the Philadelphia bench, Curt signed with the Winnipeg Blue Bombers, joining Jauch, his Iowa teammate, north of the border. Near the end of the CFL season, Winnipeg sent Curt to the Ottawa Rough Riders. Ottawa went on to with the Grey Cup, defeating the Edmonton Eskimos, 16–6. Meanwhile, back in the NFL, the Eagles also won a championship. It was clear to Curt at this point that his future in pro football would be as a blocker. He bulked up to 260 pounds but retained his speed and agility. In 1962, he joined the Dallas Texans of the American Football League and became the team’s starting left defensive end. The Texans had tons of talent on D and went on to win the AFL championship. In 1963, Dallas moved to Kansas City and became the Chiefs. With the arrival of Bobby Bell and Buck Buchanan that year, Curt became a sub, but also saw action on the offensive line. Over the next two seasons, he became one of pro football’s last two-way players. Starting in 1965, he was the Chiefs’ starting right guard. In 1966, he was part of a front line that included Ed Budde, Jim Tyrer, Fred Arbanas, Dave Hill and Wayne Frazier. They helped the club with the AFC championship and advance to Super Bowl I. After struggling through injuries in 1967, Curt played on both sides of the line in 1968, his final pro season. Curt got into broadcasting after his playing days, and was a radio personality in Kansas City for many years. He was the last Chief to play regularly on offense and defense in the same games.